Melaia is a chantress at the Temple of the Most High. One night in the courtyard she witnesses the murder of a weary traveler and quickly finds herself in a world she thought only existed in old songs and stories. Angels and immortals locked in battle. The stairway to Heaven must be rebuilt, and Melaia is pushed into a journey where she will discover angels, draks, and herself. 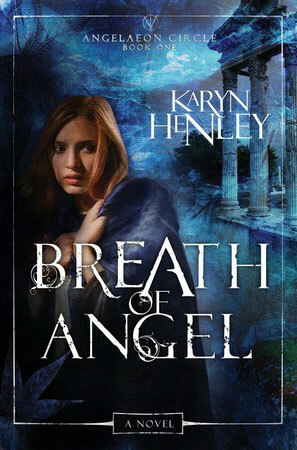 Breath of Angel is the first book in The Angeleon Circle series by Karyn Henley. Labeled as fantasy and marketed as Christian, it meets both categories well, but some may be skeptical at first, as I was. The Christian label is tested with the use of titles such as “priestess” and “chantress” and the treatment of angels. It takes awhile to start seeing some mild Christian metaphors, but they are there. This is why the category of Fantasy is so important. It allows liberty to be taken in certain areas to move the story forward, but nothing that would be deemed un-Christian. Even with the use of characters who are “chantresses” there is no use of “magic” in any way that would turn someone off, as one might expect. The story starts quick and moves along at a steady pace. Some of the characters, however, fell a little flat for me. Though not so much that it was a disappointment or a distraction. Overall, this is a good read, and it kept me interested to the end. I received a complimentary copy of this book for review purposes from WaterBrook Multnomah. Please rate my review here. You can read an excerpt here or download Chapter One. Check out Karyn Henley’s website here or her blog here. This was book 13 in my 52 Books in 52 Weeks challenge.